Train Operation Should Be Part Of Model Railroad Trackplanning. You have a good deal of your model railroad up and running. You even have some scenery and buildings. Your train operation involves racing around and pulling some freight cars from sidings and replacing them with other cars. You're bored with running trains with no real place to go and no reason for going there. Time to consider train operation. In recent years there has been an increased attention paid to operating a model railroad more like prototype railroads and making this a key component of model train layout design. Why? Because your interest level goes up. You're introducing purpose into your model train layout. I was first introduced to model railroad operations while a member of a club. Suddenly things started to make sense. My original operating scheme was pretty simplistic and involved drilling holes in the tops of my cars so I could insert colored tacks with numbers on them: colors for town, numbers for industries. However, it didn't look very prototypical and I don't think anyone today would want to drill holes in the top of a freight car they just paid thirty bucks for. I still have some of those original cars with the holes in them. There on my gotta-get-around-to-fixing-those list. The next incarnation of my operating scheme was to replace the tacks with Plastruct channels into which I inserted colored tabs. I no longer had holes in the cars, but it still looked strange and the tabs had a tendency to fall off. This was about the time that articles began appearing about Bruce Chubb's Sunset Valley Lines. I was captivated. His book, How to operate your model railroad (Kalmbach Books) is still a classic. My copy is tattered and well-thumbed. My layouts have been a freelanced design so I didn't have a particular prototype to follow. I sat down and wrote out a fictional story to give some plausibility to my trackplan. In retrospect I wish I'd done a better job of track planning before I started, but a lot of us put the cart before the horse in our rush to build a model railroading layout. Even so, my railroad was starting to have some reason for being and I was no longer bored with running trains round and round. They had some place to go and some work to do when they got there. All this seems a long time ago. Then I began using the ﻿Ship-It﻿ model railroad software to set up operations for our Wednesday evening sessions. Click on the link to learn a little more about my experience using Ship-It. We then began experimenting with the older manual system using Micro-Mark's car cards to work out some bugs in our operating system. Train operation adds a whole new dimension to your model railroad. 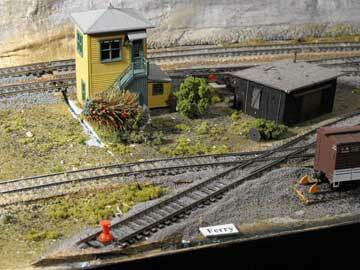 If you're a loner it makes model railroad switching come alive. If you have friends who are model railroaders, so much the better because now you can get a bunch of trains running at the same time, with or without DCC. I have a small group of modelers from our local Nottawasaga Model Railroad club who would come over once a week to run the trains and I even have a few neighbors who like to join in and they have never had any interest in trains before. I operate these days on John Houghton's N scale layout while I build my new UNRR layout. It's not ready for operations yet. We'began to work with a fast clock to operate trains on a schedule and control movement. My previous HO railroad did not have a central dispatcher or headsets to interconnect everyone by phone. We still used hand signals (and shouts). 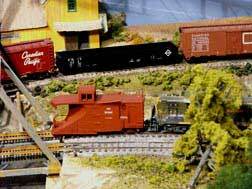 Part of the railroad was "dark territory" and part had been wired with LogicRail model railroad electronics and signal circuits by Bill Hudson. Over time we all end up with more cars than we can use at any one time without overcrowding yards and sidings. One solution is to add a "fiddle yard" where cars can be kept until they're needed. 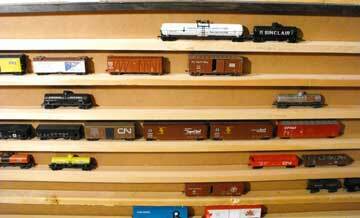 This fiddle yard takes overflow from a yard and has some "beyond the layout" industries. The ferry hadn't been built at this time so cars were "fiddled" off into a 3-drawer storage cabinet on wheels. Push pins make good bumping posts on grades and at ends of track. An excellent publication to get you started is Realistic Model Railroad Operation by Tony Koester (Model Railroader Books). Here are some of the best from Kalmbach. There is an excellent introduction to Time Table and Train Order (TT&TO) operation in the February, 2009 Scale Rails published by the National Model Railroad Association (NMRA). The article is Operating on the Wabash Second District and this layout was on display at the 2009 National Convention in Hartford, Connecticut. There is also a sidebar article on the Operations Special Interest Group (OPSIG). Another good reason to become an NMRA member. Discover more at www.opsig.org. Here a snow plow was being run as an "extra" to clear the right-of-way north of Summit Siding on my Utopia Northern RR. Go from "train-operation" to Methods of Operations. Go to Operating with WiThrottle on an iPad. Go to JMRI Operations Software. Go to more train videos. Return from "train-operation" to my Home Page.